Last week, I had the privilege of serving as an honor guard during the public viewing of our late Archbishop Emeritus, and wanted to share a little story about my experience. My “tour of duty” was from 5:30 to 6:30 Tuesday afternoon. I arrived early in order to avoid being delayed by Chicago’s notorious rush-hour traffic. I vested quickly and took a seat along the one of the side aisles of Holy Name Cathedral. There were probably 100 people scattered about praying or sitting quietly. The Cathedral doors were open allowing the sounds of the city to filter in, along with a steady stream of visitors. My first impression was of awe at the silence. Yes, you could hear traffic, and sirens, and the occasional whinnies of a mounted patrolman’s horse, but all inside the sanctuary was still. You got the sense that all who entered were stepping from one world into another the moment they crossed the threshold. Chicago is a diverse, multicultural city and that fact was reflected in faces of those who came to pay their last respects to this holy man: African-Americans, Asians, Latinos, Filipinos, Polish, Russians, Germans, street-people, policemen, business-people, clerics, Evangelicals, Orthodox, Catholics, Buddhists, and Hindus. Everyone of them visibly saddened by the loss of a man who had been, regardless of their faith or lack thereof, their pastor and friend. One woman, who it transpired was a transplant from Ireland, noticed my robe and sat down next to me to ask about it. I explained our Order, then noticing how red and tired her eyes looked, I asked how long she had been in the Cathedral. She told me that she had been there since the reception of the body at 2:00 that afternoon, about 3 hours past by my watch. Intermittently wiping away tears and between sniffles, she shared what a huge presence Francis Eugene George had been in her life. She sat with me for probably 20 minutes, telling me all about her life and the Cardinal’s role in it. A role I’m sure he had no idea he played, and a thought that was not lost on me. We never know the influence we have on others, for good or ill, this side of the grave. Better for us—and the countless others whose paths we cross along the road of life—that we strive to make our lives a truer reflection of what we say we believe. Always the teacher, the good Cardinal was giving me a lesson I very much need. Somewhat easier said than done. Assuming our posts, three things became immediately apparent to me: First, the stream of visitors picked up significantly as people got out of work. The line was solid from the door of the Cathedral to the foot of the altar where Cardinal George lay in state. After a short time, the line was split into two so as to better accommodate the crowds. Second, everyone wanted to touch him, or touch their rosary or a holy card to his foot, or at least the casket. What could I do? I let them. Third, I didn’t know where I should look. I wanted to avoid each person’s gaze, so that they could feel “alone” with the Cardinal as much as possible. Therefore, I chose a point in the middle distance on which to focus my attention. This was not always possible, however, as some of the visitors exchanged a word with us as they left, or maybe a smile or a handshake. One old man, clearly from the “old country,” smiled and took my hand. In his thick, broken English, he rasped, “God bless America!” then hobbled away. Toward the end of our hour, I noticed a young priest in line on my side. He was weeping copiously. There had been a constant flow of Roman Catholic clergy all day paying their last respects to their Metropolitan, but this young man stood out from the rest by virtue of the force of his grief. When he reached the head of the line, he became even more anguished. He clutched the Cardinal’s foot with both hands and wept unashamedly for several minutes. I am certain that in that moment, he was completely unaware of anyone else in the vast sanctuary but himself and his spiritual father. I wanted to put my hand on his shoulder, but felt that it would be an intrusion into a holy place I was not allowed to enter. All I could do, was hang my head and pray. After his farewell, he hurried away, making straight for a side door, but he did not leave my consciousness, and maybe never will. When our tour was over, my fellow knight and I were dismissed by our relief. We gave our condolences to the family represented in the front pew, then made our way with aching feet and backs, to sign the guest book. Discussing it afterward, we agreed that this was one of the most uplifting and faith-affirming things we had ever experienced. Supertankers of ink have been spilled, and are yet to be spilled on the legacy of Francis Eugene George. What he lacked in physical stature he more than made up for in his towering intellect, influence, and holiness. And yet, for all that, and despite his high office, here was a man who carried himself as a lowly servant. But for those of us he left behind, he was our shepherd, our father, our conscience, and a heroic model of Christian service. Which brings me back to that young priest. How many men did Cardinal George inspire to a life of radical discipleship and service to the Lord through the martyrdom of the priesthood? It is well known that he most liked being around young priests. They were his children. They were his friends. In the end, they were his pall-bearers. They are his legacy. Given such a heroic and compelling example, how many other young men would discover a vocation to the priesthood, or religious life? If we lack vocations in the Church, we should look no further than our shepherds AND the respect we, the faithful charged to their care by God, pay them. 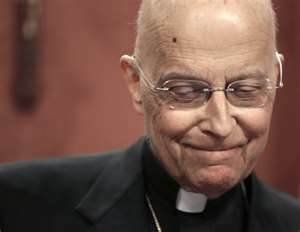 To use inelegant, modern language, Cardinal George “imaged” Christ the Good Shepherd to his flock very well indeed. In return his flock respected him above all else. We heard his voice, even if we didn’t always heed him. That fault lies with us, not him. What a beautiful tribute to a beautiful man. Thank you for these words full of truth and solace and love. Previous Previous post: Fr. Thomas Hopko, R.I.P. Next Next post: Look What I Found!